Matthew McConaughey stars in “Interstellar.” Photo credit: Paramount Pictures. More often nowadays, films are fueling the conversations about the end of the world. Will we run out of food and supplies? Are we poisoning our air and water? What can we even do about it? In Christopher Nolan’s latest sci-fi adventure, Interstellar, audiences are exposed to a near future Earth that is desperately suffering from climate change, drought and food shortage. A small group of explorers (Matthew McConaughey, True Detective, 2014; Anne Hathaway, Les Misérables, 2012; David Gyasi, Cloud Atlas, 2012; and Wes Bentley, Pioneer, 2013) are tasked to travel beyond our solar system and uncover a planet that can sustain life. During this interstellar voyage, it is necessary that they capture data about a newly discovered wormhole where one hour equates to seven years on earth. Fuel is running low, and tensions are high. This crew must surpass human space travel limits and endure the pressures of saving mankind before it’s simply too late. Former NASA pilot, Cooper or “Coop” (McConaughey) is raising his two children Tom (Timothée Chalamet) and “Murph” (Mackenzie Foy), while living on their farm with grandpa (John Lithgow). This rural region has certainly seen better days. A quick trip through town shows its devastation – beaten pickup trucks and jeeps, masks, goggles, and dusty denim. Farmers fear the dust storms that have grown increasingly frequent and more intense. With each storm panic further ensues. Is the end really near? Is there any way to escape. While many may remark that the trailers for Interstellar remind them of last year’s Oscar-winning hit, Gravity, I can assure you that this film is an original. It’s exceptionally detailed with remarkable visuals as Nolan, who is well known for his many mystery/thriller/sci-fi hits like The Dark Knight and Momento, does not disappoint here. The run time is too long, however, and the fluctuation between relativity in space, flashbacks and life on Earth can become confusing. Despite the mystery and fear of the unknown, McConaughey manages to keep audiences relatively calm with his tranquil voice. 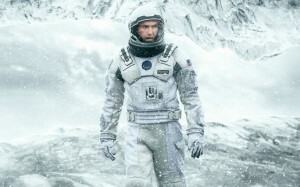 Hathaway complements McConaughey’s character as the younger, uptight scientist. The rest of the crew, Gyasi and Bentley work well in their roles, but have minimal screen time. Coop loves his children, but has a special bond with Murph as her love for science and space match Coop’s passion. After Coop is recruited for a secret NASA mission, Murph is beyond devastated. Murph couldn’t come to terms with the fact that her father left and her stubbornness resulted in radio silence with her father during a majority of the years he spent in the stars. Interstellar does not include a misplaced, unnecessary romantic storyline. The audience’s emotion and empathy stem from the deep father-daughter relationship between Coop and Murph as well as Coop’s intense desire to complete his mission so he can see his family again. Father-daughter relationships are front and center in this film. Cooper’s boss Dr. Brand (Michael Caine, Now You See Me, 2013), is also the father of Coop’s colleague Dr. Amelia Brand (Hathaway). Dr. Brand (senior) develops the equations and theories behind their mission. He and Murph stay on Earth, while Cooper and the female Dr. Brand, take on the wormhole.